Roulette is a game wrapped in a veil of mystery. Every time when we hear the name of Las Vegas, we relate it to the countless casinos and loud game tables. Of course, we can’t help, but imagine all the crowded people at the roulette table, staring at the spinning wheel on pins and needles to see the winning number. Being one of the oldest and most played games nowadays, it is worth to look back at its origin. In fact, the name “roulette” means a small wheel and that is namely the symbol of the game. What is a game of roulette without the actual spinning device?! It is not needed to answer that question, but let’s check what is the mystery around it. Every gambler knows that roulette is a game of luck, but also of mathematical calculations of odds, house edge and payouts. That’s why it should not be a surprise that the inventor of the spinning wheel is a mathematician. Of course, to create such a perfect device, you need to have some knowledge in physics as well. Narrowing the possibilities, history leads us to the name of the French physicist Pascal. As a matter of fact, all great inventions had a different initial purpose. It is the same also with the roulette wheel. The aim of Pascal was not to invent a casino game, but to invent a machine in a perpetual motion. Unfortunately, his attempt failed, but it gave birth to the delightful casino game. Followed by his design, Roulette was established as a gambling game in 17 century France. In 1842, two brothers by the names Louis and Francois Blanc revolutionized the layout by adding a zero pocket. This became the model for what is known today as European Roulette. Francois Blanc opened a casino in Monte Carlo, where roulette found its true home and gained incredible popularity. In fact, there are many different theories about the actual birth of the game itself. Some consider that it stems from a Chinese board game, others believe that it is deeply rooted in Ancient Rome, Greek also have their fair share in the game, but the credit is taken by France. The game can be traced as far back as the 17th century. Interesting enough is the fact that during that period gambling was illegal. With the coming of the new century, new gambling rules were introduced. This led to the spread of the game and the rules remained pretty much the same even nowadays. The regulations for France remained still in effect, so the gambling was still forbidden. That is why Francois and Louis needed to find a new place to introduce their game. Thus, they changed the spot from France to Germany. The game was a total boom among the gambling community there and that is how roulette entered Europe. A couple of years later, the game was brought back to France upon the request of the prince. The structure of the wheel itself remained unchanged for quite a lot of time, since the two brothers added the well-known zero pocket. Every versed gambler knows that it offers bigger profit to the casino, also known as house edge. It was a massive change, which is kept even nowadays. 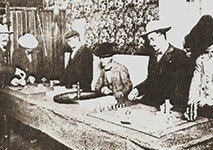 French immigrants took the game to New Orleans and thus roulette entered America during the 19th century. But it was not that welcome as in Europe and the real reason is that the American casino owners were not happy with the low European house edge, so they almost double it. This led to the reflux from the game, because the players were annoyed by the low amounts of money that can be earned. Thus, they “re-shape” the standard European version of the game and introduced second zero pocket with double zeroes. Nowadays, it is known as American roulette, even though it is not the most preferred since it is disadvantageous to the player. The proof is that only 5 percent of the gaming revenue is considered to come from roulette. In an attempt to lure the gamblers to the game, American casinos accepted some changes, which led to the further evolving of the game. More and more casinos accepted the single-zero type of wheel. Talking about America, we cannot help but relate it to the many modernizations. US casinos introduced also electronic boards at the wheels, which suggested the recent winning number. What is more is that the limits on each table were increased, which provided the gamblers with chances for higher earnings. With the modernizations come the convenience. The rise of Internet made it possible for many busy people to enjoy the game while at home. There are even some great advantages to play online. At first place, you can focus on your strategy without all the shouts, which can distract you. What is more is that online roulette is completely automatic. Don’t hesitate to try yourself in playing online at a licensed and legitimate casino. Moreover, you will get some detailed information on all the odds and payouts. As mentioned above, roulette has been around long enough. Over the years, people have invented many strategies to dominate the opponent. It is not a secret that some used even magnets to control the wheel, but there are also some legal ways to gain the upper hand over the house. You just need to set aside enough time to verse your skills in the game and place the right bet. Back in the days, there were even some conceptions that the wheel cannot be beaten, but that is far from the truth. Roulette is a game of strategy, calculations and luck.